Migrants at a squalid camp in the Moroccan city of Casablanca have few hopes for the future, after their dreams of a new life in Europe were squashed. 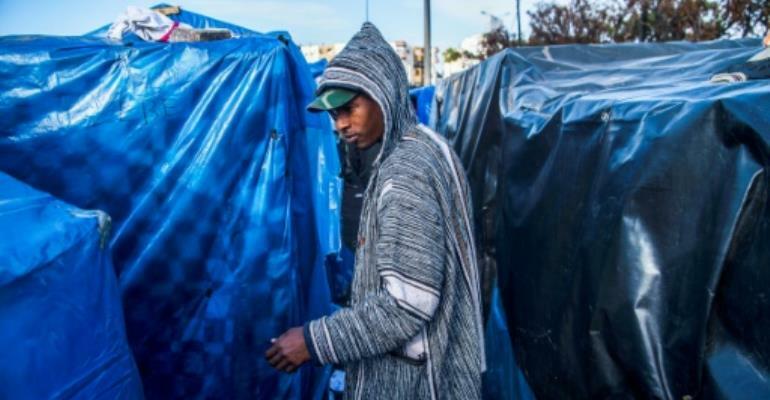 Illegal but tolerated, the Oulad Ziane camp is the last of its kind in the country following the dismantling of similar ones in southern Agadir in March as well as one in the central city of Fes. "This is no life. All we have is God," lamented Marcelin, a Cameroonian who has been in Morocco for five years and is now stranded in the camp after several failed attempts to leave for European shores. "We don't expect anything from anyone, but we hope at least for a little security and hygiene for children," said the man in his 30s. He was speaking ahead of a visit to Morocco this weekend by Pope Francis who will make immigration one of the themes of his landmark trip. 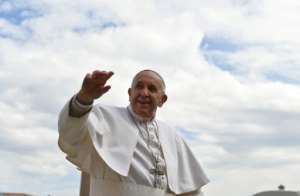 In a message sent Thursday, the pope said he would meet with "migrants ... who represent an appeal to build together a more just and fraternal world". Home to migrants from across sub-Saharan Africa, the Oulad Ziane camp is a scene of misery and despair. The number of migrants at the camp varies, but can exceed 2,000, said Lassine Camara, who calls himself the "president" of the Malian community and a spokesman for Cameroonians, Guineans, Ivorians, Nigerians, Senegalese and others there. They take cover under makeshift shelters of wooden pillars topped with blankets or sheets of plastic. A water hose has been installed by non-governmental organisations to provide water to drink and for washing, while the groups also ensure rubbish is cleared away, according to a volunteer who did not wish to be named. Bus stations have become easy gathering points for migrants who can at least use the toilets, said Alpha Camara, a Guinean who leads a Rabat-based association and who also represents those from sub-Saharan Africa. "There are very few structures for migrants: we are scrambling to give them a semblance of dignity," said an activist in Casablanca. Five migrants died in 2018 at camps in the northeastern region of Nador due to "disease and poor hygiene", according to the Moroccan Association of Human Rights (AMDH). The authorities are working to clear illegal camps without developing reception facilities, according to several sources. "The Moroccan policy is to put the migrants on buses and deport them from the north," the Casablanca volunteer said, adding some migrants have endured this five or six times. The interior ministry's immigration director, Khalid Zerouali, however denies they are being deported, a term used by human rights defenders who denounce "massive arrests" in recent months in the north. Faced with higher migration flows since the closure of the road via Libya, the authorities last year stopped 89,000 attempts at "irregular immigration", including 29,000 at sea, according to official figures. Non-Moroccans arrested at illegal camps are sent home, including 5,500 who returned voluntarily in 2018, or moved to other cities, according to Zerouali. 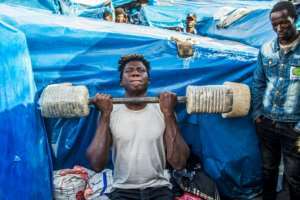 Since the start of the year, about 9,000 sub-Saharan migrants have been "removed" from along the Mediterranean coast under a law that bars those without residency from certain areas in order to stop trafficking, he said. Ahead of his visit, the pope said he was coming "as a pilgrim of peace and of fraternity, in a world which has great need of both". "If the pope comes to speak about migration, then I hope the world can see the misery in which we live," sighed one Senegalese man at the camp who hid his face for fear of being arrested and deported. Near him, a man cooked up a pot of rice to be sold in portions as youths played table football beside a pile of garbage. "We sleep where we urinate," said one angry young Burkinabe man. The camp suffers from a "lack of hygiene, violence and makeshift structures", said a representative of a local association. Last year it also witnessed four fires as well as clashes which erupted between migrants and residents, according to the volunteer from Casablanca. Despite this, the Cameroonian Marcelin still thinks integration is possible for the migrants and that it is easier for Muslims. Morocco says it has a "humanist" migrant policy and has conducted two campaigns since 2014 giving residency to 50,000 illegal aliens.